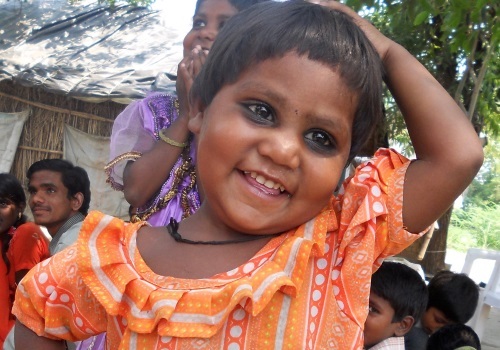 Priya is a 5-year-old girl who lives on the Yamuna Floodplain. Her parents, like the majority of those living on the plain, have no skills other than farming. Priya lives with her parents, two brothers and two sisters. Nobody in the family has received any education, as the expectation is that they will join the family farming business. As soon as they are of age, they will learn to harvest vegetables, which their parents will sell in town. The closest school is over three kilometres away; over a dangerous road, and these children do not feature on the government radar so would be unable to join. Priya loves to explore the local area and now knows the Yamuna well. When she discovered our centre, which at that time served only higher-level students, she began to come every day and watch the children from a distance. The children of the Yamuna, unlike those of the other centres, are served a full lunch that is generously donated by one of Project WHY’s sponsors. This allows us to provide the children with proper nutrition, and also frees their parents to spend the day on the farm. Priya would watch the secondary students get served every day with wide and envious eyes. Rajesh, a teacher at the centre, one day decided to bring her into the centre and offer her a meal, which she was delighted to accept. Rajesh started talking to Priya and asked her if she would like to study. She explained that she knows only farming techniques, but she doesn’t enjoy such work and would like to be able to read and write. It was this conversation that inspired us to create the Yamuna primary programme, through which we now teach eighty-four students. Without birth certificates, these students rely on Project WHY for all of their education. We therefore run the centre as a full-time school, following closely the Government syllabus and giving the children the basic skills of literacy that they deserve. As for Priya, she now dreams of being a teacher, and in fact loves her studies so much that she tried to come to school on a Sunday!